…And within seconds, I wonder again why the hell I drank all the eggnog. This year, instead of having the guilt of drinking too much eggnog, I decided I would have the guilt of eating too much eggnog. Thinking that my strategy to eat instead of drink eggnog would be a good way to get my eggnog fix, I was wrong. 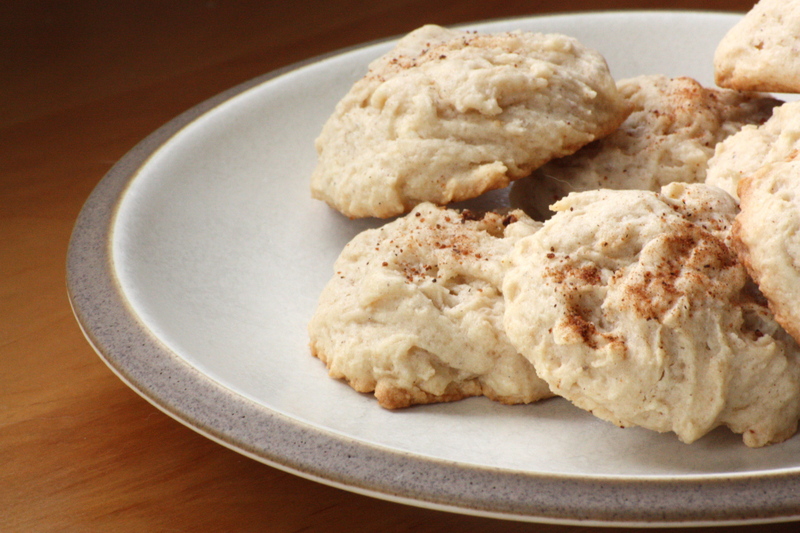 These Eggnog Cookies have a half cup of eggnog in the dough, which to me did not seem like enough to bring out the flavor, even if nutmeg was sprinkled on top. I was right. These cookies were more like a spiced shortbread, almost like a Spritz cookie. They also look like dumplings which made it very difficult to photograph with due justice. Don’t be fooled by the photographs or the fact that the eggnog is difficult to discern. These are still buttery bits of goodness (though I still crave that glass of eggnog). Preheat oven to 300 degrees. 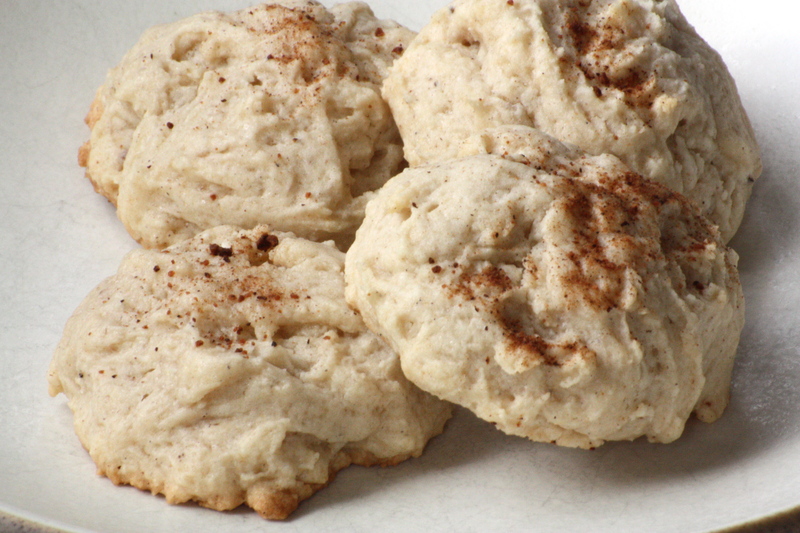 In a medium bowl, mix the flour, baking powder, cinnamon, and nutmeg with a wire whisk. In a larger bowl and with an electric mixer, cream sugar and butter until grainy paste. Add eggnog, vanilla and egg yolks and beat at medium speed until smooth. Add dry ingredients to wet ingredients until just combined. 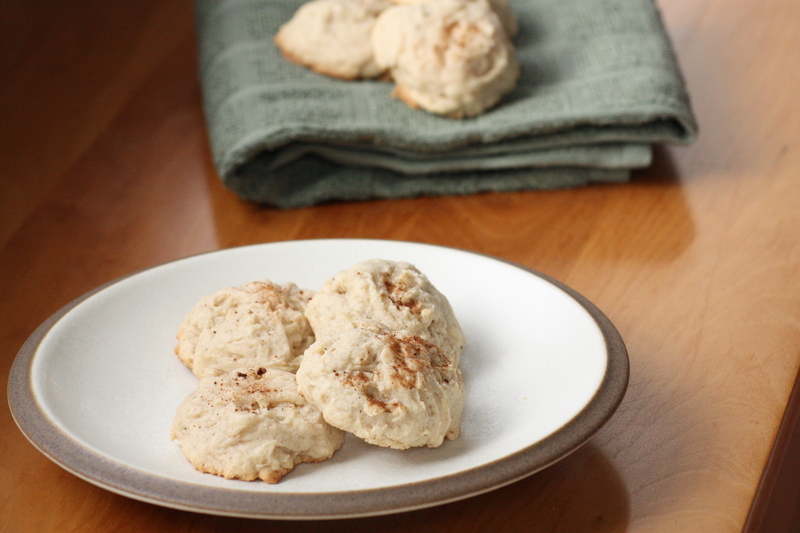 Drop 1″ balls onto greased baking sheet and sprinkle with nutmeg. Bake 23-25 minutes until the bottoms become slightly brown.